It looks deceptively simple, but requires a lot from out students. I first taught the students character traits in general. I have about 10 ELL students and many of these words were not known: superstitious, optimistic, rambunctious, insecure, rebellious, etc. 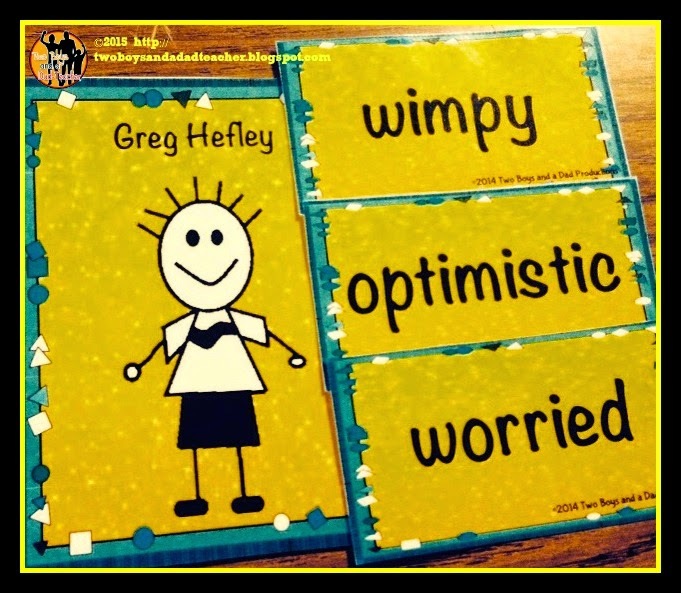 I used well known characters, such as, Harry Potter and Pippi Longstocking, and The Wimpy Kid to help the students assign character traits to them. We discussed why this trait or that trait can be attributed to the character by providing text evidence. For example, we said that the Harry Potter was resourceful because he was able to get himself out of many dangerous or tricky situations. 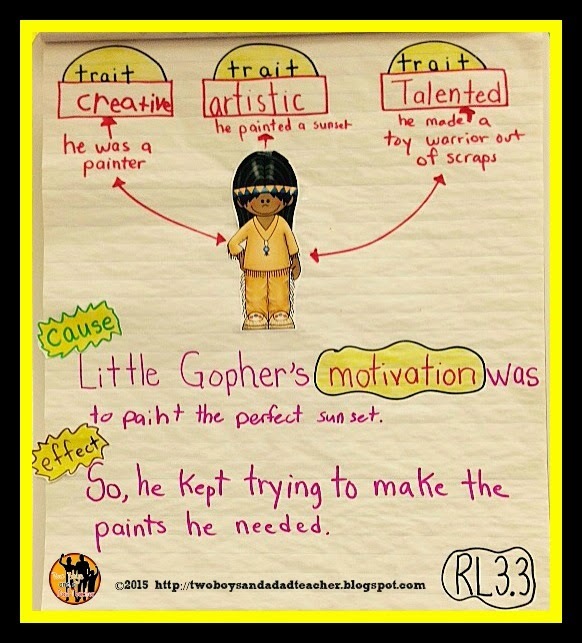 Once students understand traits, then it was time to move onto motivation. 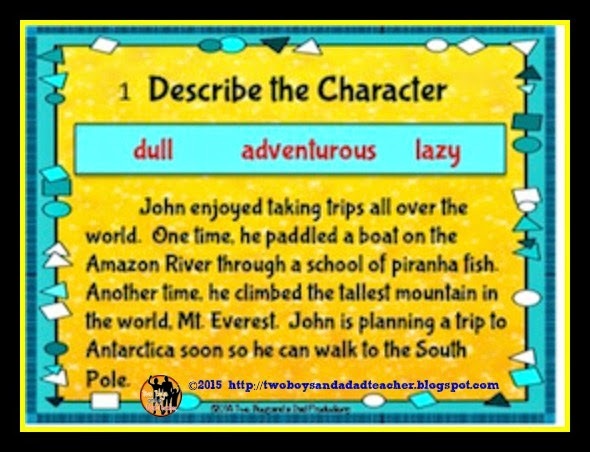 We practiced daily too, with character description cards. These cards contain 3 character traits with a paragraph describing the character. The students need to match the trait with the description, but provide example from the text to back up their choice. I defined motivation as the “why the character does what he or she does in the story.” I used an example of a detective or crime solver who always is looking for the suspect’s motivation since that would be needed to convict a suspect in court. For this I used 2 particular stories that I have used in the past and fit perfectly with the Folktale Unit I was currently on: The Legend of the Indian Paintbrush and The Legend of the Bluebonnet. Both stories are Native American folktales from the Plains group retold and illustrated by Tomie DePaola. Before moving onto character analysis, I made sure the students knew these stories well, including the central message (see previous post on central message). In the story, The Legend of the Indian Paintbrush, the main character Little Gopher is on a quest to paint the perfect sunset. However, he just can make the colors or paints needed to paint it. Because he was true to his calling, he is rewarded by the Great Spirits with paintbrushes and paint to paint the perfect sunset. We discussed as a class what his motivation was…..why did do the things he did? In the end, we decided his motivation was to paint the perfect sunset. How did this affect the story? He tried hard making different paints but each time they were dull and not right, but he did not give up. The chart below captures our thinking. We also labeled it as cause and effect, because if you think about it, motivation = cause and events = effects. Previous Post I’m Guest Blogging over at Minds-In-Bloom!